The following photographs are by kind permission of David Brown of BW who has an extensive collection of photographs, if not of all, certainly nearly all of the boats owned by BW over many years. From the few photographs below of these boats it will be seen that they are the boats most of us have seen all over the system for years. They have been and some still are along with their replacements, the work horse's of BW, we pass them without a thought but like many things on the waterway of today they are becoming a thing of the past and are disappearing. 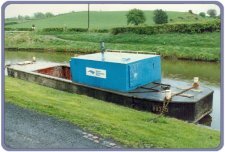 They have been painted in many colours to suit the latest corporate image of BW our boat finished up in green livery before BW returned to blue livery of today albeit a darker blue to the livery of the 80's as seen below. They never had names only having their five digit fleet number plate welded onto their squared off bows. Later some boats after probably a re organistion had just a B letter with a two digit number painted on them, which is probably were the B52 class of boats description comes from as given to us by some of the local towpath based BW staff. 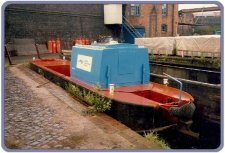 The first is of our butty when she was much younger, or at least after she had been repainted, including the chains to her rear fender. BW gave her the Fleet or index number of 80369, but she had the number B61 painted on each side of her hull at the bow . Photographed in the Broad Street Basin, Wolverhampton, described on the slide as on the Walsall section dated 25th August 1986. Thanks to Francis Stapleton for the following information about our Butty. She was built in 1970 for the grade cost of £1800 and appears to have had a working life of over 30 years before we acquired her. From Francis it would be in order that she retains her B61 identification as that would help to record her history in future. She was probably built at the now defunct BW Work shops at Goole but to date this has not been confirmed. 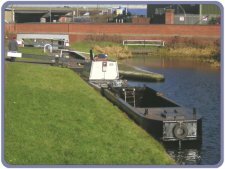 When we first acquired the boat her engine deck section had been rendered suitable for the BCN, ie locally fitted (probably Bradley Work shop) a raised lockable lid had been placed over the engine bay to stop the engine being removed. As it would appear that when first built the class of boat did not have any sort of lockable lid or even any sort of deck covering in this area. Also the stern of other vessels did not seem to have fitted the fender bracket and rudder assembly found on the BCN boat, was this another local modification? The cabin design appears different as a raised section can be seen in the roof with hand rails bolted thro the roof. The construction was in fibre glass with more rounded corners, her index number painted on the cabin side with the colour and logo of the time. A metal up stand had been welded to the hull at gun whale height to attach the cabin too and make watertight. Doors and hatches appear to vary from boat to boat. From other photographs the boats were fitted with reflex diesel heaters with a tank fitted on the forward bulkhead of the cabin. We found an old tank and section of chimney for such a heater in the hold of the boat when we emptied her. 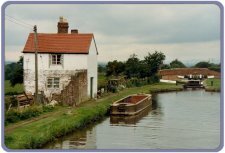 Another of David's photographs of a butty very similar in general appearence to our boat when we inherited it. This boat number 80375 has no cabin fitted or any steel work for one to be fitted. The up stand for the fitting of the fibre glass cabin can be seen on our boat as she was on the Tatbank in 2005. Again no rear deck lid or fender/rudder bracket. Must have been towed or motored and steered by an outboard motor with some extra rudder and tiller fitted to the motor? Compared to the working boats from the hey days of the canals, these boats handled like bricks, and the fins and rudder fitted to our boat was probably an attempted to improve the handling. My recollection of meeting these boats was that they where always going like a bat out of hell to maintain steerage. The stern of the boat appears to have no centre plate to the pontoons, being able to see into the engine bay. Some of these boats remained open all their working life, cabins being fitted to only some boats. The location of this photograph taken on the 15th July 1987 is marked as 'Halfway' on the slide, I feel I should know where this is but the building throws me, as I think is may be on the Curdworth Flight? Another example of an open boat this time fitted with lift in and out pods. Obviously cannot see the stern arrangement but it would probably have been as above, powered and steered by an outboard motor. This boat photographed at Tardebigge on 16th April 1986, having the fleet number of 80372 and B67 painted on her, but on the slide it states that the boat was displaced, whatever that was (probably one of BW's many re organisations) and then was given the Fleet number 80909 and the number B23 at a later date. An example of this type of boat that could be seen anywhere on the system. This boat Fleet no 80367 photographed on the 7th July 1986 at Accles & Pollock. The general arrangement of cabin hull and equipment appears to be as expected. The Diesal heater tank can be seen on the front cabin bulkhead, the cabin on this boat as on many others appears to made of metal with square corners and handrails welded onto the roof. The five digit fleet or index plate can be seen clearly on her bow welded to the hull. Her stern appears to have a tiller so she may have a similar extra rudder as our boat did prior to the conversion carried out by us. Another typical boat, metal cabin, with flue to the Reflex heater plain to see on the roof. The cabin on this boat Fleet number 80370 photographed on the 1st May 1987 at Tardibigge, appears longer than all other examples. It may also be the angle of the boat to the camera coupled to the longer cabin that distorts the lenght but she does appear shorter then other examples. The rear deck is different to the BCN boat having a lockable lid to the engine bay that is flush to the rest of the deck, but again no rear fender or rudder arrangement. 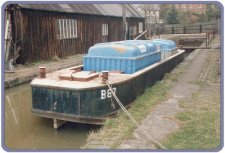 The long lid with the triangular ends that can be seen on the boats, gave access to a compartment that on our boat appeared to have brackets in it and holes in the bulkhead to the engine area that probably mean'nt some sort of petrol or fuel tank would be housed in this area. Also a hand operated bilge pump was fitted in this area on our boat, that had a flexible canvas pipe fitted to the outlet so any water etc could be pumped over board. Holes welded up in the rear cabin bulkhead also indicated that some sort of pipes ran through into the cabin area from this section? The index plate on this boat is fitted to the stern sides, just to show that every boat was different. Today 80369 has been shortened by cutting off the pontoons at the stern either side of the engine box. Thicker metal add to the new stern and push bumpers attached, metal floor removed and replaced with a wood one. 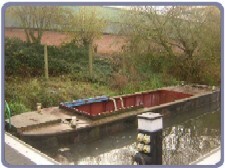 Rear deck formed around triangular section from old boat, with the mooring bollards being re positioned on the new deck. Side steps fitted to the original boat are now bolted to the rear load area bulkhead to ease movements from motor boat. The orginal lenght of the boat was 35feet 6ins, her new lenght is 31feet 9ins with an load area of 19feet 3ins. Today the boat has a new lease of life being pushed by Pheonix the unit being 69feet 9ins long. Lorry type racket straps hold the two boats together so firmly that the unit handles as just one boat. A step in the front of the hold of Phoenix has been added so along with the rear steps in the butty movement between the boats can be made safely, hand rails have been added to the butty near to the steps to complete the job. Already the boat has proved it self attending a number of society work parties and the clean up at Walsall in 2006, on all occasions her load area has been filled. Having researched the issue we re instated her fleet number of B61, by welding the number on her bows.